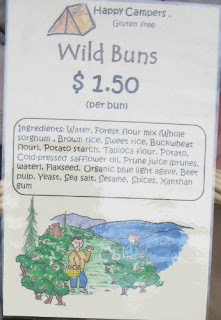 Around late May, I received a message from some of the great people at Happy Campers to review some of their "Wild Buns." With summer now here, people probably would want to get the grill out and have some burgers. I gladly accepted the offer, getting a sample of four gluten-free "Wild Buns" from Zoe at the Lake Oswego Farmers' Market on June 2. Maybe the auto default option is to make a burger. Get some beef (or even veggie) patties, lettuce, tomato, the usual burger condiments, and nosh away. I actually had a few other plans for the buns, though. Amazing, this is one of those very rare blog posts where I actually get to make something at home! 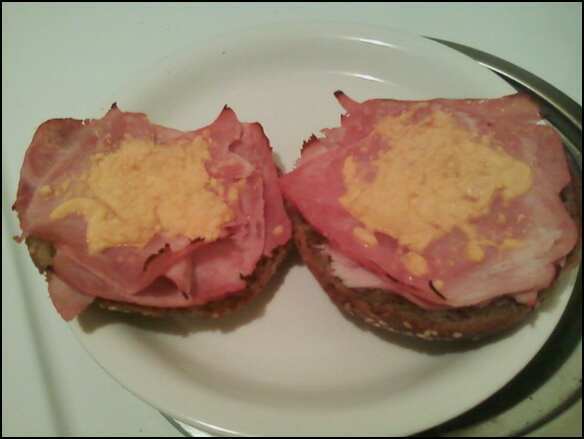 One morning, I tried an open-faced sandwich, toasting each half of the bun, then adding some cold-cut ham and a little cheese. I then threw it under the broiler for just a little bit. I intended to melt the cheese, but in my attempt to try this fat-free cheddar option, I think it just hardened into a little shell on top instead. 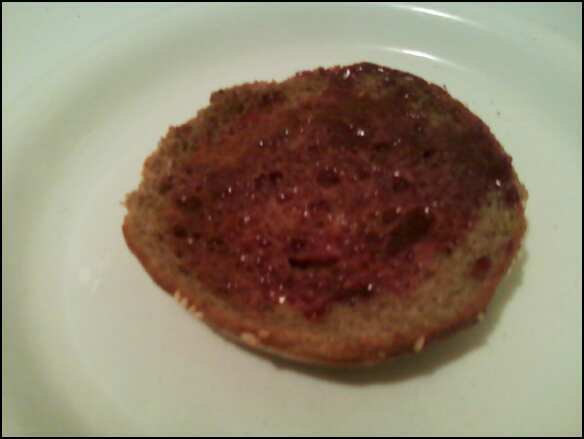 I then took another bun, toasted it, and ate it with some jam and cinnamon. Trying it with sweeter condiments was nice, although I think the flour blend used here (plus the sesame seeds) probably make this more ideal as a savory item. Wouldn't stop me from trying this again, though. Finally, I went the more traditional route, making myself some turkey meatloaf (healthy! 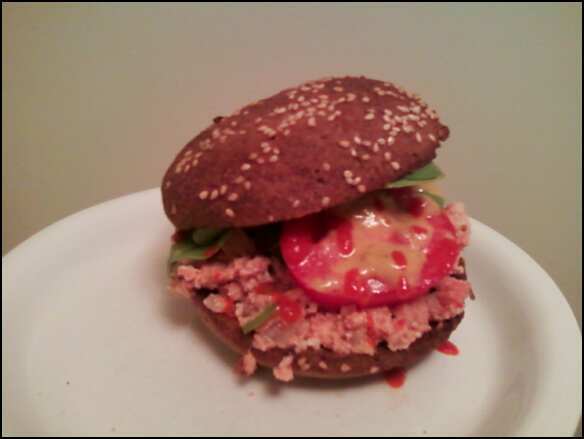 ), toasting another wild bun, adding some feta, spinach, and tomato, drizzled some hot sauces, and boom, healthy turkey meatloaf burger. And it was fantastic. The bun here had amazing crunch, held up nicely against all that filling. The instructions from Happy Campers suggest to toast these buns before eating. They're dead-on with that one. There's nothing like a toasted piece of bread, whether a slice, a bun, a whole baguette, etc. It all worked here. In all cases, the "guts" of the bun got rather fluffy, while the toasted exterior had that pleasing crunch I wanted. They gave me four buns; on the last one, I merely had another turkey meatloaf burger as shown above. 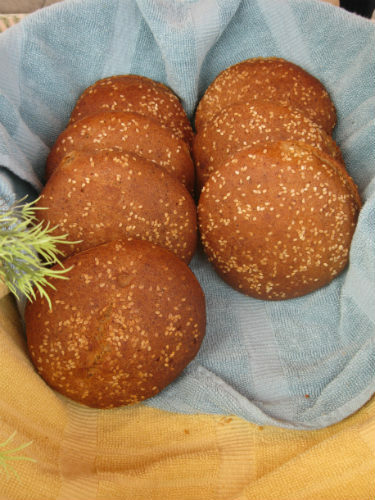 Bottom line, get these wild buns. Gluten-free items are generally more expensive than their gluten-filled counterparts, but you'll enjoy the quality that goes into each item sold.